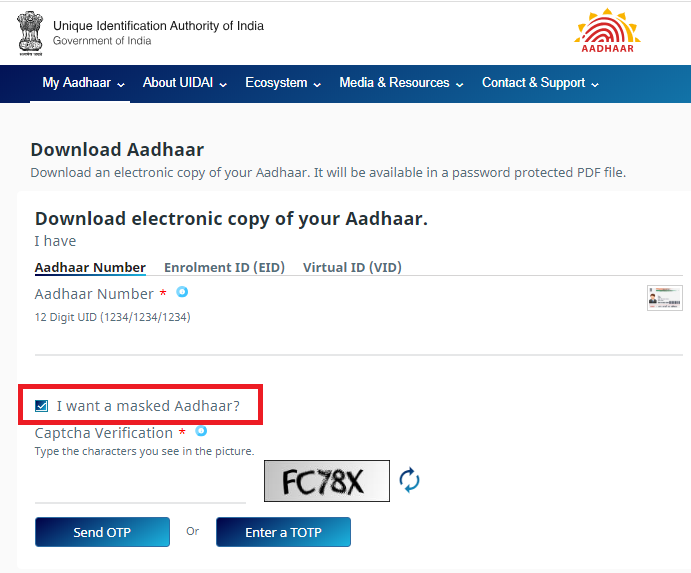 Downloading Aadhar Card Using Your Aadhar Number: The Govt of India had issued Aadhar card to almost all the citizens of the country and it is a unique identity accepted everywhere. Here I am going to show you how you can download Aadhar card using your Aadhar number. So if you have made or applied for an Aadhar card and have not to get your card till now then no need to worry the Govt. of India has provided an easy platform to download your Aadhar card all you need to have is either you enrollment id or you Aadhar number and your registered mobile here I will guide you how you can download your Aadhar card using the Aadhar number step by step with full explanation so lets start. The UIDAI (unique identification authority of India ) has issued Aadhar cards to all the Indian citizens. It is a type of identification card issued by Govt. of India which can be used throughout India for various purposes and it can be used as one solution to all kind of proofs. In the future, it is going to have a great significance as it is partially made mandatory in some fields due to its special and biometric features. Firstly open your browser (preferably google chrome) and go to the official website by clicking this link https://eAadhar.uidai.gov.in/. After clicking this link you will have a form in front of you asking for various information but we have to download Aadhar card using the Aadharnumber so in select option select Aadhar. Then start to fill all of your personal details firstly enter your 12 digit Aadhar number in reverse order. Enter your full name as registered in Aadhar your pin code and then enter the text displayed in the image (captcha code). After that click on get one-time password button, you will get an OTP on your registered Aadhar number to wait for that and once you receive your OTP enter in the space provided. After entering the OTP received on your registered mobile number it will start downloading your Aadhar card in PDF format. Remember one thing the PDF of Aadhar so downloaded will be secure and it is password protected so that when you try to open in the pdf reader it will ask for the password. The password will include first four alphabets of your name and your birth year .for example suppose your name is Ramesh Kumar and your date of birth is 15 Feb 1993 then you have to enter the password as RAME1993 remember to enter the alphabets in caps only. And you will be able to see or take print of your downloaded Aadharcard. I hope you all have completely understood the procedure on how to download your Aadhar card online using your Aadhar number and registered mobile number.